Thank You for Pushkin. He is my favourite poet since I am 3 y.o. A memories from childhood define a happiness as a feeling which influences on whole life. Today I am reading Pushkin’s fairy tales for my daughter. 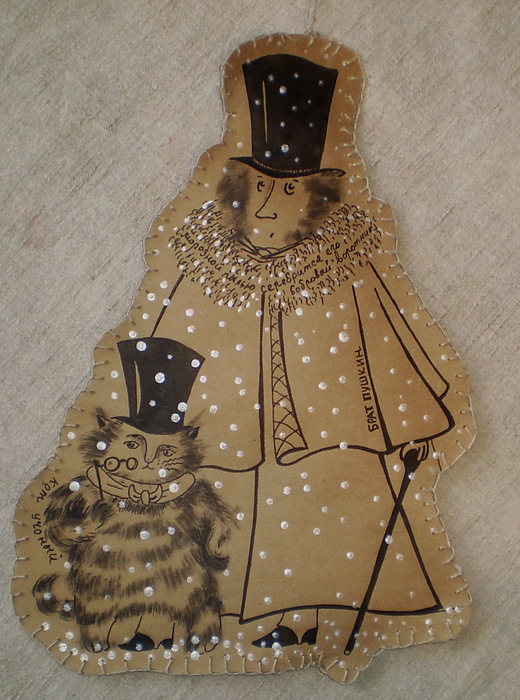 Oh, do you recognise our old friend cat Vasya? Happy meeting has happened today and Vladimir Rumyantsev, the painter, has illustrated it. 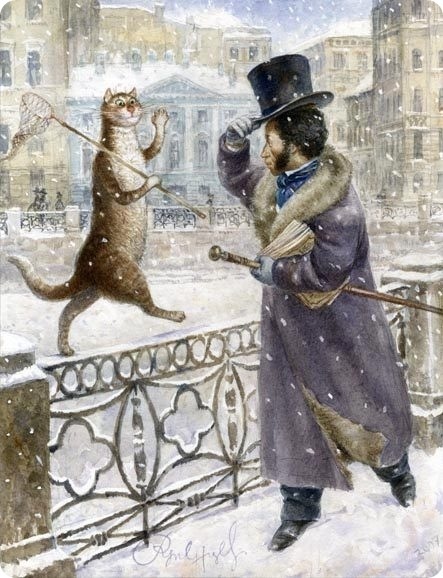 In snow St. Petersburg along Neva embarkment Alexandr Pushkin is in hurry to his beloved Natasha with a thoughts about a new fairytale. 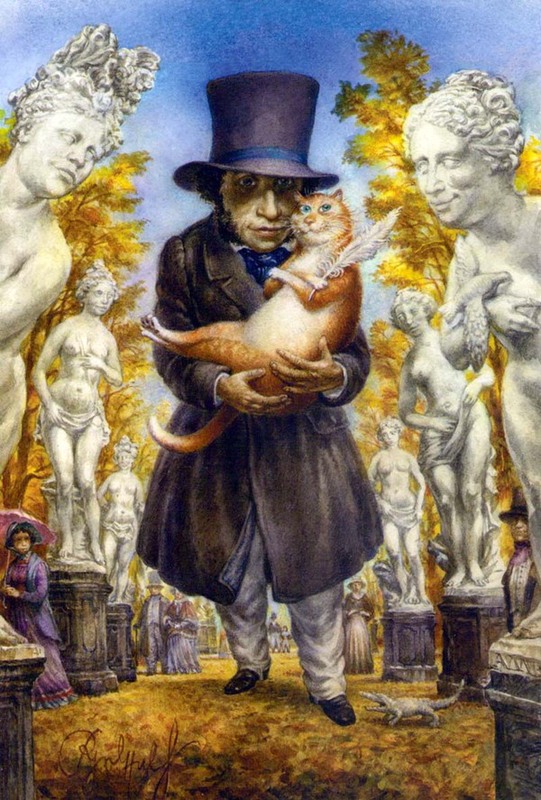 “Privet, Pushkin!” he suddenly stopped and saw a small creature – a cat. “Mmm, sorry, I heard your voice?” Pushkin is puzzled. “And you think a cats can only myay-maya-meowing” Vasya frowned, and said, “I am special, I can read your thoughts – and what you are keeping in your mind now is actually not a fairytale“. “Could you help me, dear Vasya to create a good poem?” Alexandr asked, “instead I provide a plate of milk and my warm company for you”. “Mmmmyay I should think for a moment,” answered Vasya. “Well, let’s go and write! Our happy duet is going to create” Pushkn and Vasya said in unison. to the left – a tale of wrong. My daughter loves the story and we are inspired to create together this Christmas tree decoration. 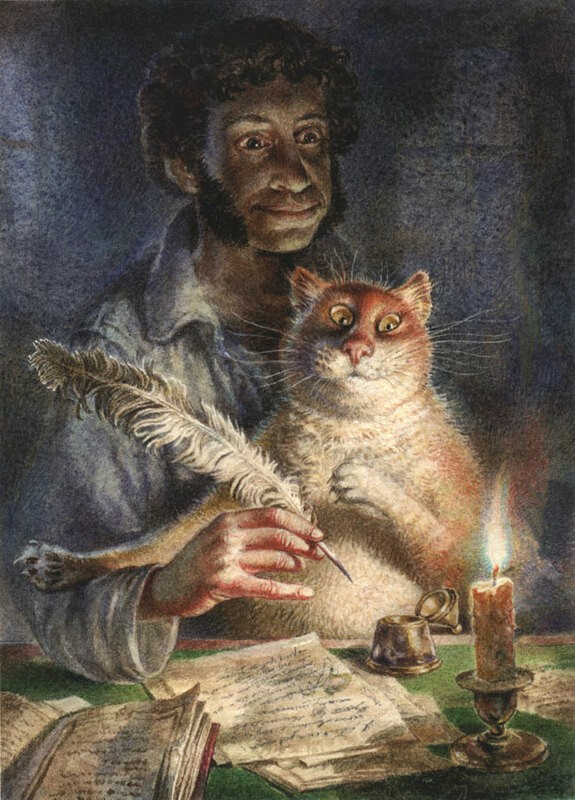 Please enjoy Vasya and Pushkin’s masterpiece. Thank you, my reader, for your smile and light from your beautiful eyes because of you I am here. Merry Christmas and Happy New Year! May the next 2015 be inspiring and fruitful for you! Best wishes! Thank you Gloriana! Merry Christmas and Happy New Year! Wishing you a 2015 filled with love, joy, and many blessings. Oh, PapaBear thank you! Merry Christmas and Happy New Year! May your fairytales come true! Best wishes! Merry Christmas and Happy New Year, Veraiconica! May all your dreams come true! So sweet and fanciful! What a lovely treat for you and your daughter. Thank you for inviting us to this enchanted world. My beautiful Linda! Merry Christmas and Happy New Year! The best vibrations from my heart are hugging you and dancing around you in Christmas valse of snowflakes. Thank you for this pleasure to be a tine part of your life. A lot of smiles to you! What a great poet. Merry Christmas. Thank you! Merry Christmas and Happy New Year! Amazing story and artwork. This tale made my night. Thank you for sharing the interesting and fun story to be read. Merry Christmas and Happy New Years to you and the family. Such a wonderful story Glorialana, and in only your posts could I find such amazing artwork to bring it all to life..
Dear wonderful beautiful Sue! Thank You for being in my life. I am so happy to be a small part of your great world, I am so happy you like something I create! I wish you Love hugging your whole world and Joy following everywhere you go! Merry Christmas! Glorialana.. How can anyone fail not to like your wonderful posts and creations.. You are a wonderful Part of my Blogging community .. and so love to see your smiles and visits..